Bicycle Bash by the Bay — Next Week! BikeCommuters.com > advocacy > Bicycle Bash by the Bay — Next Week! The fourth annual Bicycle Bash by the Bay is almost upon us…Tampa Bay’s showcase for celebrating everything about bicycles. This year’s Bicycle Bash event (www.bicyclebash.com) will be extra special. The Cure on Wheels bike ride is our presenting sponsor, so this year’s event will be known as the “Bicycle Bash by the Bay, presented by Cure on Wheels.�? As our presenting sponsor, Cure on Wheels has exclusive food-vending rights to the Bicycle Bash and is partnering with several local restaurants to sell food at the event. SWFBUD has switched to North Straub Park from Vinoy Park to allow a national senior men’s cross-country race to be staged at Vinoy Park. The national race is drawing 1,200 competitors and there will also be hundreds of high school runners in running events at Vinoy Park, which is next to Straub Park. The Bicycle Bash is expected to draw many visitors from the next-door running races, boosting our attendance with folks from both the running events as well as those visiting downtown St. Petersburg. – Singer-bicyclist Rachel VanSlyke is biking from North Carolina to perform. – The Youth Triathlon Series, led by Suzanne Henslee, is having its season celebration at the Bicycle Bash. 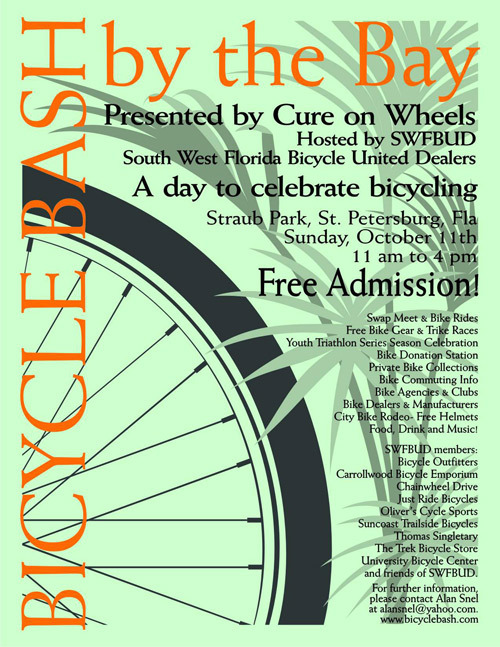 – The St. Petersburg Bike Club will have Share the Road bike rides throughout the event. – Pinellas County bicycle personality John Sinibaldi is returning to be the event emcee. – The city of St. Petersburg will be giving away free helmets and holding a bike rodeo. – Cure on Wheels will be signing up bicyclists for its ride. – Flatland bike performances will be held. – A Swap Meet, free gear, public agencies that support bicycling and a bike-donation station will be available. If you can’t make it, stay tuned for coverage. I’ll be there taking photos and video of the various events throughout the day. Also, if you live on the Tampa side of the Bay and want to ride your bike over to the Bash, the Seminole Heights Bicycle Club is hosting a ride to the event. The SHBC is meeting at the Seminole Heights Garden Center (5009 N. Central Avenue, Tampa) at 8:30 AM on October 11th to ride over. Come join us for a fun 25 mile jaunt across the water! Check out our coverage of the Bash from 2007 and 2008. This year’s should be even bigger and better, so if you’re in the area, come on out and enjoy a day of bicycle love! I’m debating bringing my rehabbed kiddie trailer down. Come on, Raiyn…you should be there — it’s always a good time! I intend to come, but like I said, I’m not sure if I should drag the trailer out. Well, either way, I’ll be at the Seminole Heights Bicycle Club tent part of the day…and gallavanting around the rest of the Bash taking photos and hobnobbing with fellow bikies. See you there! If memory serves, there will be too many people for me to comfortably pull the trailer through the crowds. I’ll come but I’m most likely coming bike only.